Posted On March 17, 2014 by Team iCynosure. Over the last decade online shopping has become such a routine thing that for most people it is a task they do from the comfort of their own homes, enabling them to compare prices and products at a click of the mouse. Gone are the days when you forget to get a particular item or stand in long queue to make the payments or carry heavy bags around. The beauty of technology, for which we have to thank all those geeks working on these developments. The concept of online shopping was first introduced in the late ninety's by Amazon and as the company witnessing a profitable development, others followed suit. A large number of online portals sprang up and ventured into the sector to maximize the early entry gains. E-commerce has made shopping such a pleasure, as one can get everything from clothes to beauty products, shoes to books and even electronics after comparisions without any worry. The service industry too hasn't lagged behind with banking, payments, travel arrangements and even movie tickets all being offered electronically. Naturally this would pinch the until now authorative organised Offline sector and thus began the clash between traditional and e-commerce giants. To pull the customers towards them each tried to overdo the other and thus consumers were offered discount coupons, sales and free gifts on purchases,etc etc to lure them in. And the advantage in this crazy circle of 'trade-war' for the first time moved from the business houses to the 'aam adami'. Yes, you and I are the biggest gainers today. So wherever you are, you cannot remain aloof from this maze and once you jump in to explore it, you shall have a tough time getting out. The icing on the cake became creamier with numerous online portals now offering not only Discount Coupons but also attractive Cashback Percentages on purchases.... a DOUBLE DHAMAAL, a 'twice as nice savings' for consumers. In the hustle bustle to create brand loyatly portals are initiating tie-ups with numerous brands offering practical every product and service available. Being a new momma, online shopping is a boon for me especially when the lists get longer every month. Instead of stepping out with my princess looking for great bargins in supermarkets on specific days while being pushed around by a zillion women trying to grab the last discounted piece on the shelves, I prefer to order from the comfort of my home when princess is resting. A monthly order of around INR 3000 for princess's toiletries enables me to save close to 750 INR by way of bargains (combo offers), discounts and cash back. INR 3000 for Diapers, Baby Wipes, Baby Lotion, Baby Cleansing Milk, Baby Shampoo, Disney Bubble Bath and a few other toiletries. Portals on an average offer 20% discount and I saved over INR 600, paying INR 2215 on delivery. I received most of the products in 24 hours and the lotion in 2 days straight. 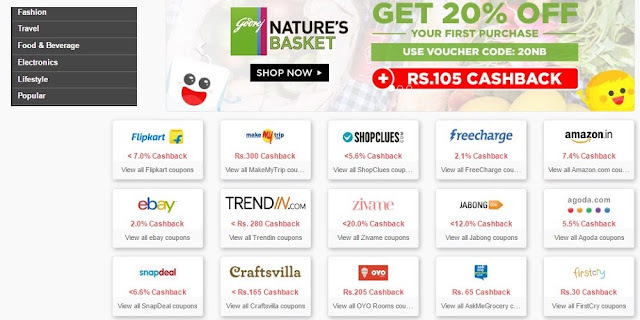 The day I received all the products, an alert on my email notified me that I had a confirmed Cashback in my Coupon's account. So who in their right minds would go to the retail outlets, looks for offers and end up paying full MRP after standing in the queue for hours and lugging the bags around. I've used Online Shopping successfully to save money and you could too. It's free to join and every transaction you make to Shop, enables you Only to Save More through fantastic BARGAINS, COUPONS and CASHBACK. Try it, you've nothing to lose. Simply loads to gain!